The gold price fell by $6 or 0.5% for the week to close at $1,200 as of the final trade on the New York COMEX futures exchange by Friday afternoon. It is sometimes helpful to change our perspective on the gold market by consulting the gold mining complex. The companies that dig the precious metal out of the ground – is pricing in for their very product. As a result, the miners must have some idea on what the gold price of their product will be doing, as their corporate valuations are largely based on the price of the metal itself. Below we show the intermediate perspective for the GDX gold miners fund on top. Immediately below, is the price of gold, both since late-2015. Most importantly, is the aspect of the chart. Note where the GDX gold miners fund is positioned, relative to the gold price. The GDX is slightly below where it was at the December 2016 bottom near $18.0 (upper green highlight). Now, let us follow the green arrow downward to see what the corresponding price of gold was at the same time. The answer? $1,125 per ounce. The GDX is now slightly below where it was in December 2016. Consequently, we can say with some clarity that the gold miners are, in sum, pricing in between $1,110 – $1,120 per ounce for gold at the present moment. Thus, $1,110 – $1,120 becomes a high-probability target for gold price over the coming months, and could represent a solid intermediate-term buying opportunity for investors. 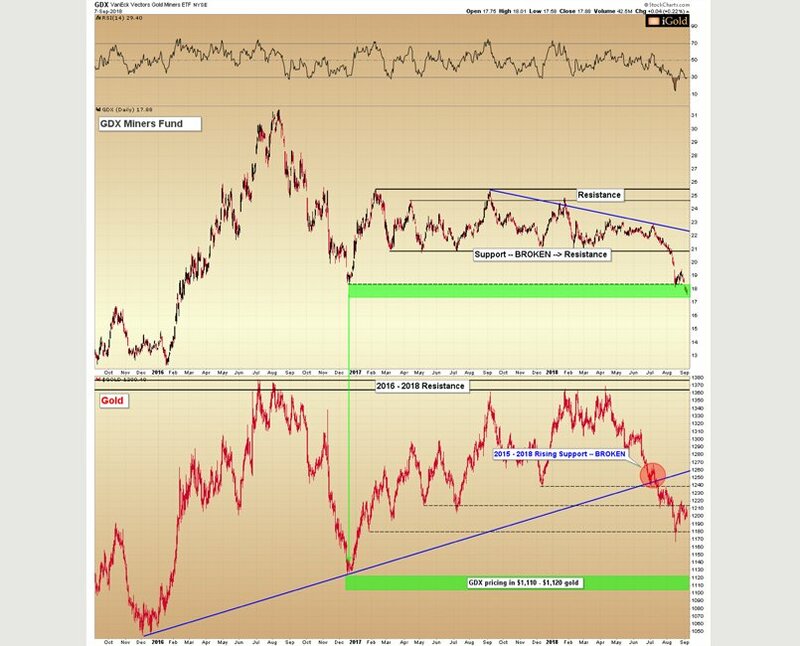 How Might Gold Reach This Target? We expect that the GDX-derived target will not be met with gold falling in a straight path lower. No market moves in a straight line; a significant snap-back rally is due, although it has remained elusive thus far, and we must be open to the possibility that it will start from a slightly lower level. 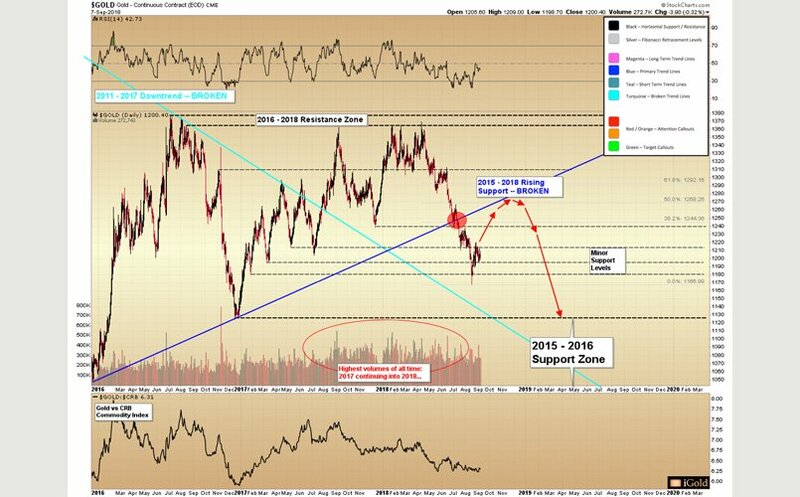 Expecting that gold may have begun its counter-trend rally from the recent low of $1,167 on August 16, we have added Fibonacci retracement calculations onto the primary chart above. Accordingly, these are shown in the light silver color according to the key. They are barely visible so as to not distract from the primary trends. The calculation levels appear toward the right side of the chart with corresponding lines. Notably, the 50% retracement of the entire decline at $1,268 is close enough to the now-broken (blue) primary trend-line at $1,261 that the $1,261 – $1,268 zone becomes a highly-probable retracement range where the gold price will encounter significant resistance and likely turn lower again, indicated above by the red arrows. A counter-trend bounce is due at any moment, with significant resistance expected in the $1,261 – $1,268 range. The gold mining complex is now pricing in gold near $1,110 – $1,120. This may provide the next solid intermediate-term buying opportunity. Take this opportunity to purchase your most wanted precious metals products whether they are bullion coins or bars.